Discussion in 'PC Hardware and Software' started by TheMightyS, Aug 29, 2012. I don't know if Samsung is now just taunting Apple or if their user interface "designers" are the same lazy idiots who copied the iPhone icons. In any case, this is getting hilarious. Or pathetic. Or disgusting. Or all of the above. Check out the S-Launcher that will be included in all their Windows 8 machines. Seriously. Samsung thought that this was good for their Windows 7 machines, so they thought it would be great for Windows 8 too. The only difference with OS X Dock? It includes the search-and-launch function of the Start button. Oh, and the tray has a rounded edge on the front! INNOVATION. But "oh wait," some misinformed imbecile will say, "docks are not new! Samsung can sure go ahead and copy it all—the functionality, look and feel of Apple's dock! After all, you can't patent trays! Amirite?" Of course, docks are nothing new. The first dock—a tray that holds frequently-used program icons for easy access—was introduced in NeXTSTEP in September 18, 1989, the operating system created by NeXT, the company that Steve Jobs founded after he left Apple. It was the very first time that someone had the idea of creating such a launcher and it worked just the same as OS X dock—or Samsung's "new" S-Launcher for Windows 8. Drag icons to it for easy launching. Eventually, NeXT was bought by Apple, who turned NeXTSTEP in what we now know today as OS X. The dock evolved during that process, going from a flat 2D surface to the familiar pseudo-3D glassy surface with live icon reflections, the centerpiece of OS X's user interface. Back in the 90s, the idea was so good that is inspired other operating system manufacturers, including Microsoft. They introduced their own Start Menu in Windows 95—which was heavily inspired by both the NeXT looks and the Mac System's Apple Menu. The Start Menu, however, was quite different from the dock and the Apple Menu. Nobody would confuse them. You know, great artist steal and all that. 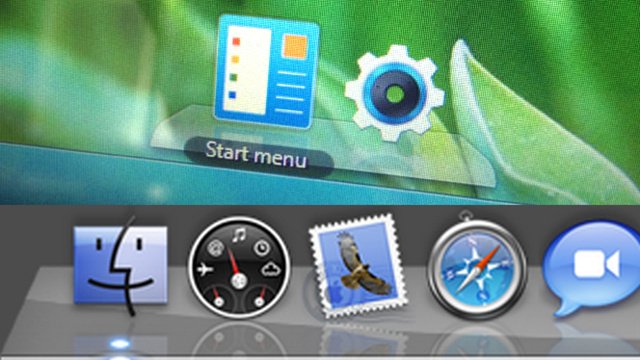 Samsung's S-Launcher, on the other hand, is clearly made to look like Apple's OS X dock. In this photo it shows only the start icon and the preferences icon, but populate it with other app icons, make a capture, put them side to say, and you got the dock. Except for that amazing curved glass tray. The Dock, as you can imagine, is patented. Its design and functionality is credited to Bas Ording, Donald Lindsay and, drumroll, Steve Jobs. initpidzero hope u r reading this... will they ever make something original??? Check out the S-Launcher that will be included in all their Windows 8 machines. can you please share citation of any official statement from samsung in this regard? that is from yahoo. and they are quoting it from another website. hardly anything official. it still isn't something official. and it is again quoting mashable. ok.. i surrender.. !!! to mashable.. samsung might still be digging apple archives to look for the dock launch official statement to COPY that as well!! !